When I visited Washington at Easter, we (Andi, Sam and I) chose an object that I could use to create something in glass. The object we chose was a pine cone. You’d think that’d be simple to use. Perhaps to create the object in glass? Perhaps use the texture from the cone? Or something else? When I showed the tutor she dismissed creating it in glass as the cone was open and difficult to cast. 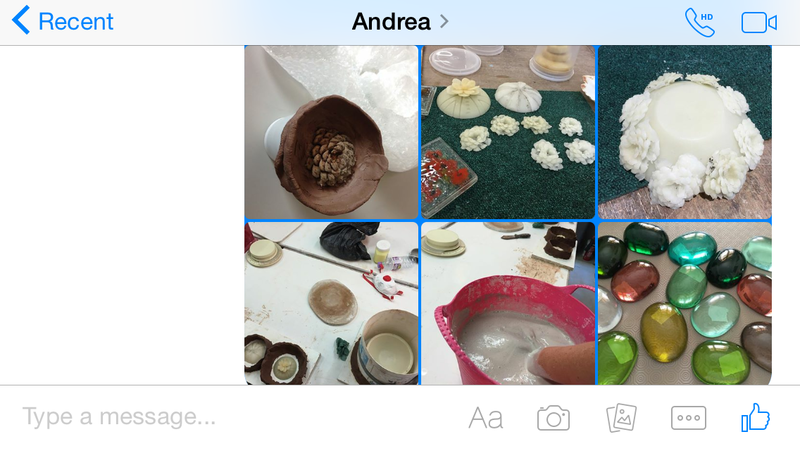 She suggested I use the base to create a latex mold and then add these ‘flowers’ to a piece. Over several weeks, I’ve been making the wax ‘flowers’. I decided that I’d like to do a bowl with the flowers around it. 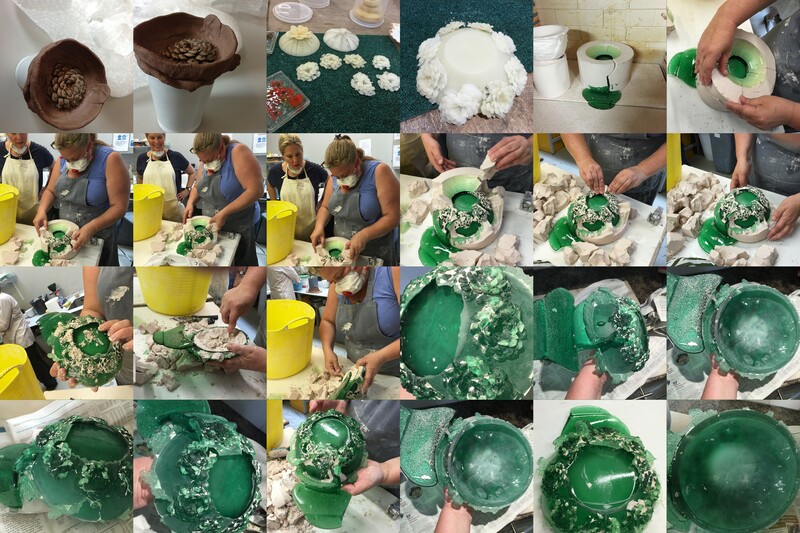 The process is the same, create the was ‘flowers’, create a wax bowl, affix the ‘flowers’ securely and try to close up the gaps to reduce risk with plaster. It takes an age to get the completed wax model. Then I mixed up the plaster and flint mix to pour over the wax model. Next stage is to steam out the wax. I purchased some emerald green gaffer glass which flows faster than bullseye glass. I then handed it over to the technicians to fire in the kiln. All the above I did without telling Andi how I was creating the piece. I was excited to create it and then present it to Andi as a completed piece in the future. In June I’d not heard from Andi for a few days and was worried. 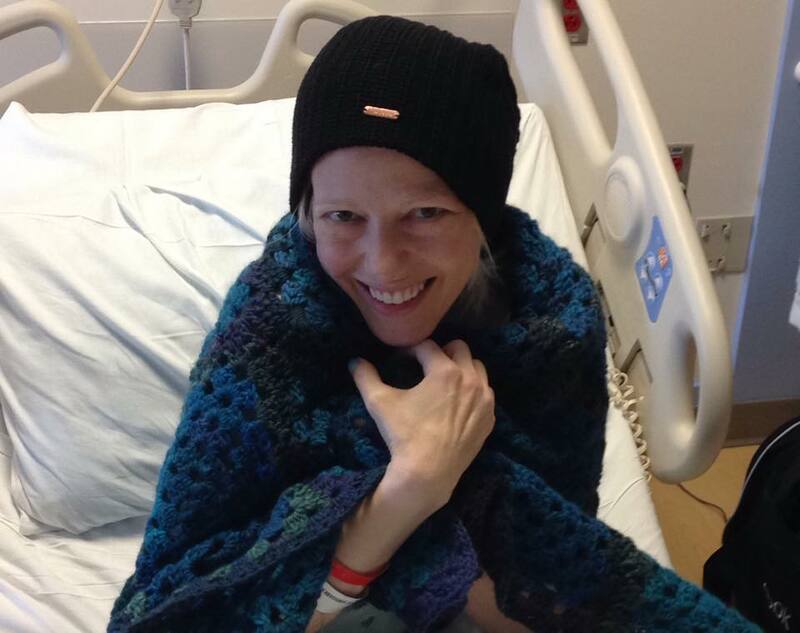 A few days later she messaged me from the hospital… and told me she was wrapped in her AnnaBlanket which made me smile. And I let her into the secret and told her what I was doing with the pine cone and a few photos. After all that work and with the terrifically important reason I was making this piece, the pressure was on for this to be perfect. Only a few days later I was at college and the piece was cooling in the kiln. I could tell that something had happened as the technicians asked me to look in the kiln. The mold had cracked and glass leaked. So incredibly upset. I love that damaged imperfect bowl. It’s not useable and needs a lot of work to clean up or reuse the glass. Right now, I can’t do anything with it except be disappointed and sad. Maybe one day soon I’ll create something with the glass that will work and be an Andi treasure. This entry was posted in Home, Living, Phyllodes and tagged Crafting, Glass, Phyllodes by AnnaGoAnna. Bookmark the permalink.